Escape the urban bustle at Mýrdalsjökull and Reynisfjara Beach. Discover out-of-the-way places like Sólheimajökulll and Wool Gallery Vik i Myrdal. The adventure continues: get engrossed in the history at Skogar Museum, Head underground at Rutshellir Cave, enjoy some diversion at Vik Swimming Pool, and kick back and relax at Black Sand Beach. To find ratings, maps, traveler tips, and tourist information, refer to the Vik trip itinerary planning website . Singapore, Singapore to Vik is an approximately 27-hour combination of flight and bus. You can also do a combination of bus and flight. Traveling from Singapore to Vik, you'll gain 8 hours due to the time zone difference. Traveling from Singapore in December, expect Vik to be cooler, temps between 3°C and 1°C. Wrap up your sightseeing on the 18th (Tue) early enough to drive to Kirkjubaejarklaustur. Kick off your visit on the 19th (Wed): take in the dramatic scenery at Stjornarfoss, then look for all kinds of wild species at Fjadrargljufur Canyon, then explore the striking landscape of Skaftarstofa, and finally take in the dramatic scenery at Systrafoss. On the 20th (Thu), you'll have a packed day of sightseeing: take in the dramatic natural features at Kirkjugolf, take in the dramatic natural features at Skaftareldahraun, take in the dramatic scenery at Foss a Sidu, then steep yourself in history at Dwarf Crags Dverghamrar, and finally contemplate in the serene atmosphere at Minningarkapella ser Jons Steingrimssonar. 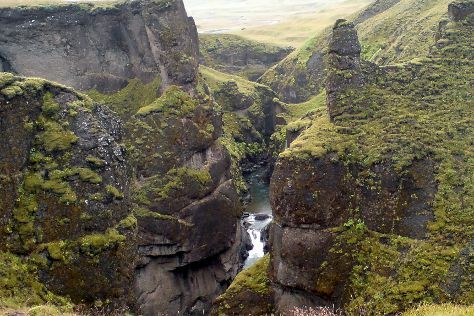 Plan my trip to Kirkjubaejarklaustur with suggested itineraries provided by Inspirock. You can drive from Vik to Kirkjubaejarklaustur in 1.5 hours. Another option is to take a bus. Finish up your sightseeing early on the 20th (Thu) so you can travel to Hof. On the 21st (Fri), take in the architecture and atmosphere at Hofskirkja Church, then explore the activities along Fjallsarlon Iceberg Lagoon, then explore the activities along Lac Polaire, and finally admire the sheer force of Svartifoss Waterfall. Keep things going the next day: get a dose of the wild on a nature and wildlife tour and then stroll through Diamond Beach. To find where to stay, photos, maps, and more tourist information, refer to the Hof trip itinerary maker site . Drive from Kirkjubaejarklaustur to Hof in 1.5 hours. December in Hof sees daily highs of 3°C and lows of 0°C at night. Wrap up your sightseeing on the 22nd (Sat) to allow time to travel to Reykjahlid. Explore hidden gems such as Hverarond and Mud Pots. Escape the urban bustle at Krafla Lava Fields and Dimmuborgir Lava Formations. There's much more to do: admire the sheer force of Hverfjall, make a trip to Viti Crater, and take your sightseeing to a higher altitude at Mt. Namafjall (Namaskard). For more things to do, reviews, traveler tips, and other tourist information, read Reykjahlid trip planner . Drive from Hof to Reykjahlid in 6 hours. Traveling from Hof in December, you can expect nighttime temperatures to be slightly colder in Reykjahlid, with lows of -6°C. Cap off your sightseeing on the 25th (Tue) early enough to travel to Selfoss. On the 26th (Wed), take in the exciting artwork at Gallery Floi, take a pleasant ride with a tour on horseback, and then contemplate the waterfront views at Kerið. On the 27th (Thu), you'll have a packed day of sightseeing: engage your brain at Hveragerdi - Stone and Mineral Museum, then make a trip to Hveradalir, then get interesting insight from Tours, and finally pause for some serene contemplation at Kotstrandarkirkja. For more things to do, other places to visit, where to stay, and tourist information, go to the Selfoss trip itinerary maker site . Do a combination of bus and flight from Reykjahlid to Selfoss in 5.5 hours. Alternatively, you can drive; or take a bus. Traveling from Reykjahlid in December, plan for a bit warmer nights in Selfoss, with lows around -2°C. Cap off your sightseeing on the 27th (Thu) early enough to travel back home.